Gray skies could not dampen the enthusiasm of the 250 people who attended the annual CRCC Thanksgiving Mass this year. 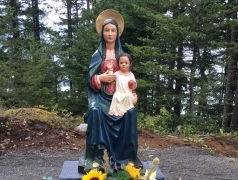 With the mountains rising in the background and looking out through the trees to the waters of Howe Sound, it could not have been a more perfect setting for prayerful reflection on the dream of Copper Ridge Conference Centre. 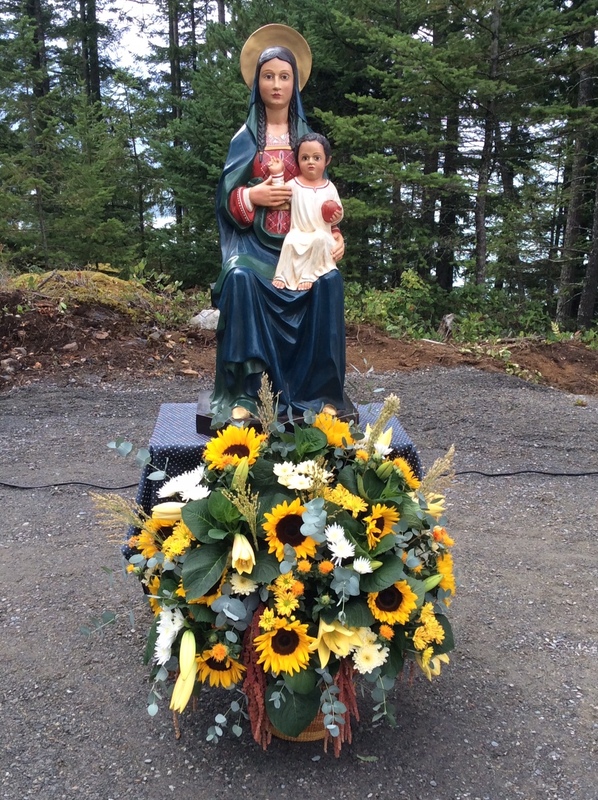 A beautiful statue of Our Lady of Fair Love, adorned with flowers, had been placed beside the altar. Many people took their pictures in front of the statue which has now been donated to our future Conference Centre. We were fortunate to have Mr. Mark Donnelly and his family as the choir. Many of the prayers of the Mass were sung in Latin, along with sacred hymns that added an ethereal quality to the beauty of the liturgy. Msgr. Fred Dolan, Vicar of Opus Dei in Canada, emphasized how much this project will help families for generations to come. He told an anecdote of a little handicapped boy who was taken to Lourdes by his parents to pray for a cure. The youngster asked Our Lord to cure him, insisting several times, and then told Jesus, “If you don’t listen to me, I will tell your Mother.” The boy was cured at that moment and everyone who was there saw him get out of his wheelchair. Fr. Fred told us that we should do the same; go to Our Lady and ask her for help to complete the CRCC project. Those attending were awestruck by the tremendous progress made thus far. Pictures do not do justice to what is being accomplished on the site. Our sincere thanks to all those who are bringing this project to completion; together we are completing the dream.